↑ Solway, Diane (August 1991). 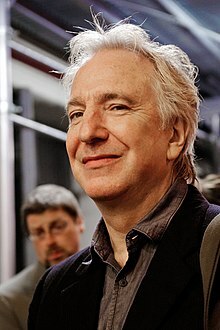 "Profile: Alan Rickman". European Travel and Life. Archived from the original on 6 October 2007. Retrieved 3 October 2007. ↑ Shoard, Catherine (January 14, 2016). "Alan Rickman, giant of British film and theatre, dies at 69". Retrieved 14 January 2016. This page was last changed on 15 September 2018, at 09:01.